Foodies Figure Snacky Sammy Seeks Love. Gamers Respond. For all practical purposes, Foodies protagonist Snacky Sam has just stumbled (or hopped) into the kind of life dreams are made of. In pursuit of his dream girl he doesn’t have to hit the weight room or build a picturesque body of sinewy muscle. He only has to please her by gaining a few extra pounds. This is where Foodies begins. The couple to be is standing on the set as we witness Snacky Sammy declare his love. Pam, being the type who prefers wider, more substantial statures, tells him that if they have a future he must gain weight. Snacky Sammy reacts with enthusiasm and sets into an 80 level regimen (divided into four packs) of all out gluttony. In a mission to help Sammy have his cake and eat it too, you’re in charge of navigating his caloric consumption routes from one landscape to another. The game begins with simple routes dictated by the chomping of peppermints, chocolates, blueberries, and more, but over time the mission of en masse caloric consumption isn’t without its challenges. Before long the floating donuts and such are surrounded by bricks, spinning ninja stars, fast moving saws, and even a few shooter figures. At one point Snacky Sammy must navigate a room of ghosts for love, but for him it’s worth it. In fact, the whole game is probably worth it for anyone who has earned every possible star on Angry Birds and is in search of another time waster. Except for the fact that the caloric consumption starts to feel old after awhile (something I thought I’d never say), Foodies is wonderfully clever. The starstruck Sammy premise makes for a great setup and it seems every detail of Foodies has been carefully considered and well thought out. From the enjoyable upbeat soundtrack to Sammy’s nagging voice when you fail at your mission, this is a game that understands the power of details. 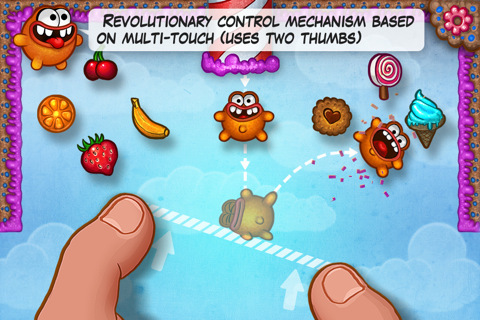 Perhaps the most interesting part of the Foodies game is the controls. 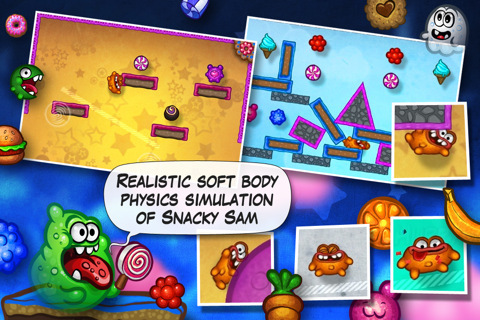 The game uses the multitouch screen to take players back to the days of Atari, only this time instead of being set with a single paddle bar, you can dictate the size, direction, and movement of the bar used to propel Snacky Sammy in blubber-like bounces toward popsicles and treats. The cute graphics are appealing and the one at a time unlockable level packs are a good challenge, but in the end the game lacks true substance. 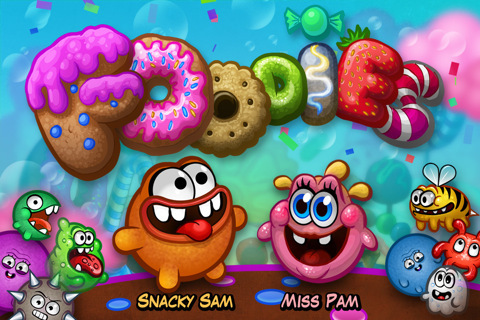 The scoring system alone isn’t a strong motivator for achievement, but Foodies wasn’t designed to become a recipe for all-at-once gluttony. 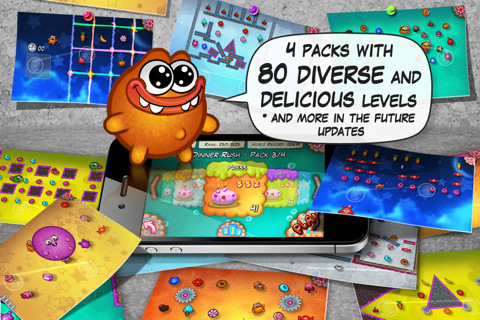 Treat the game more like that occaisional favorite dessert and the game design could stick around the top charts with almost the same legendary appeal as Cut the Rope and other favorites. 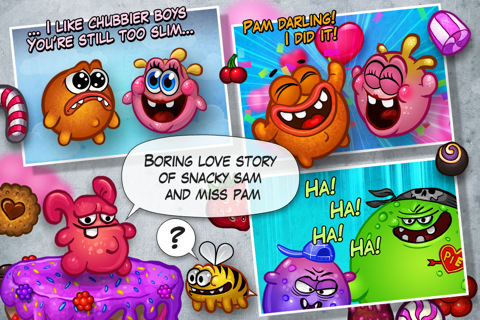 Bottom Line: The snack chasing Foodies is a clever and well executed 80 level challenge. It’s simple, cute, and perfectly charming as a time waster.